This week Nourished Living Network is having a Valentine’s Day Progressive Dinner Party! We kick off the party today with Valentine’s drinks. I’m submitting my Spicy Hot Chocolate. Jill at The Prairie Homestead submits her Peppermint Milkshake and Jessica at Delicious Obsessions shares her Peppermint White Hot Chocolate. Adrienne at Whole New Mom shares her Sugar-Free Lemonade and Coffee Substitute. Tomorrow we’ll have dishes for a Valentine’s breakfast. Sunday nights Jeff and I put the kids to bed after a busy day and settle in with a hot cup of chocolate to watch Downton Abbey. This past Sunday night I decided to make it darker, richer, and with a little kick. Thick and rich, just barely sweet and decidedly for the adults. This is perfect for Valentine’s Day, date night or any time you need a little change of pace. Small servings are best since the combination of liquid and lots of fat can make some people queasy. 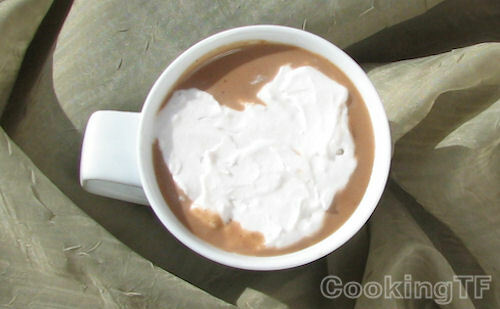 To make the pretty heart from whipped cream, whip your coconut milk or cream and spread it on a silpat or parchment covered pan. Freeze it until firm then use a cookie cutter or knife to cut out the whipped cream and float it on top of your drink just before serving. I free-handed this heart, next time I’ll get a cookie cutter. In a saucepan, combine the coconut milk, almond milk, coconut oil, chocolate chips, cinnamon, chili powder, salt and concentrace. Whisk over medium heat until the chocolate has melted. Bring up to drinking temperature, remove from heat and whisk in the vanilla extract. Taste and adjust sweetness if needed. Add additional chili powder and even cayenne, if desired. This post is part of Mop It Up Mondays, Allergy-Free Wednesdays and Fat Tuesdays. Chili powder in hot chocolate – interesting! Thanks for sharing at allergy free Wednesdays. Looking forward to seeing you again next week.